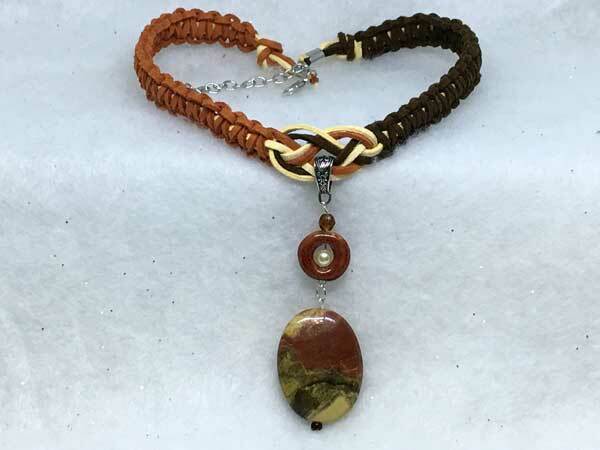 This piece is made with the beautiful richness of suede cord in rust, ivory and dark brown. The length can vary from about 16 to 19 inches with a center jeweled piece that adds 3.5 inches. The first section of the jeweled piece consists of a fully-faceted dark brown oval, sitting atop a paprika-colored ceramic donut. Within the center of the donut is an ivory pearl round. Hanging separately from this, for added movement and sparkle, is a large, oval natural stone in colors that coordinate nicely with the suede cord.